We Welcome Volunteers of All Ages: Check Them Out! We actively partner with religious organizations, schools, scouting troops, socially-minded corporations, families and wonderful individuals to strengthen our mission. Our goal is to connect kind-hearted suburban residents with hands-on volunteer opportunities that directly help Boston's homeless. We’ll work with you to find a volunteer opportunity that’s fun and fulfilling at once. Please email us to discuss ways to get involved. Have you recently volunteered for Generic Ministry and have a photo you can share? Email us and we’ll post it! Volunteer Geri goes out on the van to hand-deliver necessities to our homeless clients. Students at Eliot Elementary School make bagged meals at their monthly Sandwich Tuesday service event. Middle school students get involved in community service by folding donated clothing on Saturday mornings. Volunteer Carolyn oversees everything inside our storage facility. Boy Scouts organize a hat and gloves drive just in time for the cold winter. The principal at Eliot Elementary school works hand-in-hand with students to make 80 bagged meals. Confirmation candidates at St. Bart’s Church organize a sandwich making event and clothing drive each Spring. Long-time volunteer Rick Vincent shows off brand new outerwear donated by Charles River Apparel. Members of the Saturday morning prep crew sort, fold and organize clothing and toiletries for the van. Students at Mitchell Elementary School participate in a quarterly sandwich making event. Middle school friends work together to achieve their Community Service Learning requirement by making a week’s worth of bagged meals. Needham residents mix fun with service when preparing a week’s worth of food for our homeless clients. Students at Mitchell Elementary School line up outside the van to learn how their service efforts will be used. Volunteer Lynne hand knits scarves every winter for our homeless clients. 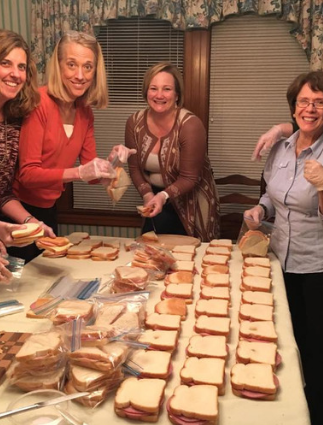 Families from Hillside Elementary School organized a sandwich making event just in time for the holidays. Girl Scouts from Broadmeadow Elementary School donated their time to help with a week’s meals. 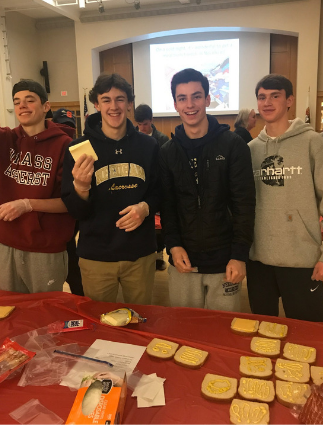 Students at Charles River School host a sandwich making event and a clothing drive each year. 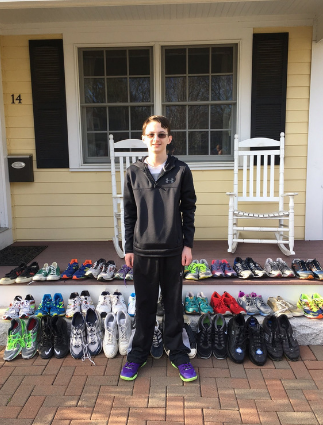 Middle school students run clothing - and sneaker! - drives on behalf of Generic Ministry. Local families baked cookies and created special Holiday Treat Bags to hand out to our clients. 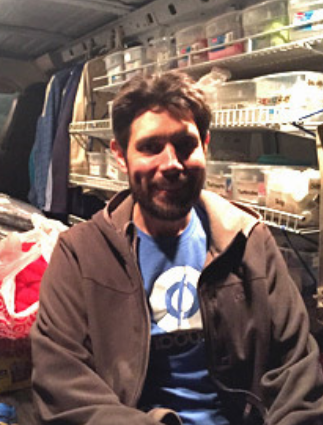 Volunteer Will rests on the edge of the van after handing out necessities to the homeless.